The Smoky Mountains turn into a winter wonderland during this beautiful season. There is something magical about seeing the mountains covered in a glistening white snow. The best place to experience all the picture-perfect winter views is from our Mountaintop Zipline Tour! These Smoky Mountain ziplines offer panoramic, 360-degree views of the Smoky Mountain scenery. Even better — the side-by-side zipline runs allow you to enjoy the adventure next to the person of your choice! We’ll even take pictures of you along the way so you can see how much fun you had surrounded by the gorgeous winter scenery. When you visit during the winter, there will be less crowds throughout the Smoky Mountains! This means there is a better chance you can book your trip on our Smoky Mountain ziplines for the date and time you want. This doesn’t apply to just our ziplines — you can also enjoy shorter lines at other popular places in the Smokies, like restaurants and shops! Don’t let the cold weather keep you from enjoying the beauty of the outdoors in the winter. Our Mountaintop Zipline Tour makes it easy to forget about the temperatures and focus on having fun. You might even be lucky enough to visit during a snowfall! You shouldn’t spend your whole vacation inside avoiding the cold when you can spend it outside on our ziplines. Just bundle up and enjoy an ATV ride, ziplines, sky bridges, and more! 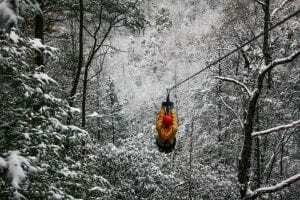 When you try our Smoky Mountain ziplines in the winter, you’ll be close to other fun activities in the area. After you zipline, try going for a winter hike in the Great Smoky Mountains National Park! You’ll have the opportunity to see snow-covered mountaintops, frozen waterfalls, and icicles. You might also have the chance to see the area decked out in millions of twinkling lights! Winterfest runs through the end of February, offering plenty of ways to enjoy the holiday lights well into the new year. We recommend taking the Pigeon Forge Driving Tour of Lights to see all the beautiful displays along the Pigeon Forge Parkway. These are just some of the many reasons you should try our Smoky Mountain ziplines in the winter. 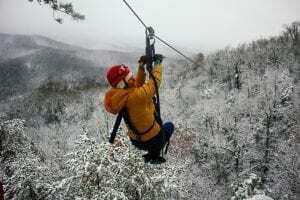 Book your zipline tour today and enjoy a fun winter vacation!